Ancient Greece was the birthplace of so many amazing inventions we still use to this day. Democracy, the Olympics, delicious olives, you can thank the Ancient Greeks for all of that. You can also throw on this dashing Greek Warrior Costume, and show your love of ancient times for Halloween! Whenever we watch a movie or play a game set in Ancient Greece, the warriors are always super ripped, and travel the world fighting enemy armies and mythical creatures while decked out in tunics and armor. While this may not provide the most effective protection against arrows, spears, or sword strikes, it definitely helps show off their battle-sculpted muscles! After all, nobody wants to see someone slay a medusa while wearing a cruddy poncho, or a pair of pants made out of an old sack. An epic battle calls for epic style, with larger than life heroes wearing bright togas and light leather armor that lets them strike quickly! And believe us, if you're going up against a mythical monster like a hydra or minotaur, you'll need to be quick. 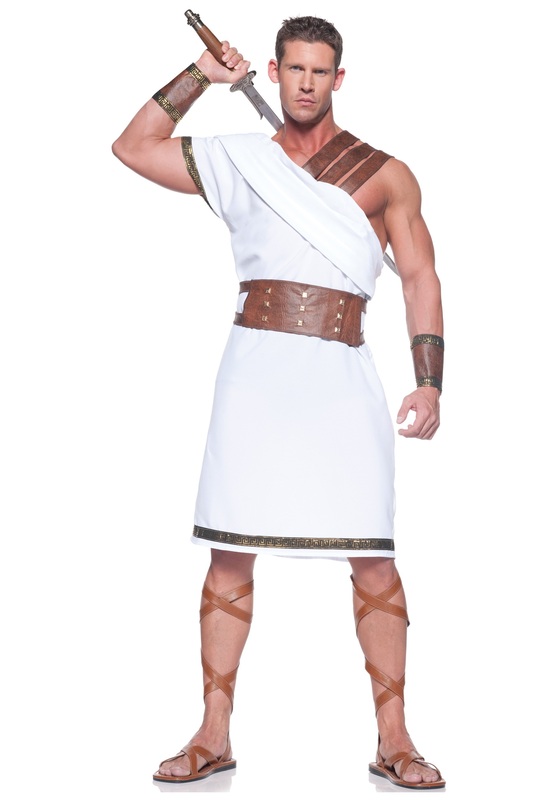 This fearsome looking tactical-toga will get you ready for any kind of mythological action you run into at your costume party! The one sided tunic is classic Hellenistic period fashion, and features leather-like straps to match the studded belt and included wrist cuffs. You'll look like the most intimidating thing to come from Ancient Greece since trigonometry!